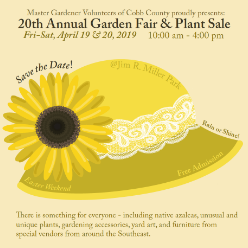 Come join the Master Gardeners Volunteers of Cobb County as we celebrate our 20th Annual Garden Fair & Plant Sale! We have over 70 vendors this year in attendance with homemade goodies for the whole family! Items for sale include: pottery, yard art, furniture, woodwork, dishes, bird houses and feeders, jams and jellies, plants, and much more!